The stele was set against a stone wall in the corner of the small room, with its protruding tenon or "tab" still inserted into a slot in a flagstone platform. A handsome, bearded figure, Kuttamuwa is depicted on the stele wearing a tasseled cap and fringed cloak and raising a cup of wine in his right hand. He is seated on a chair in front of a table laden with food, symbolizing the pleasant afterlife he expected to enjoy. Beside him is his inscription, elegantly carved in raised relief, enjoining upon his descendants the regular duty of bringing food for his soul. Indeed, in front of the stele were remains of food offerings and fragments of polished stone bowls of the type depicted on Kuttamuwa's table. Had this stele been looted, bought by a collector and presented to a museum, we would have no way of ever finding out whether cremation was practiced by this culture. 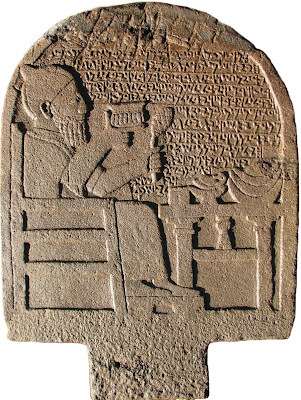 Nor would we ever know for certain that the figure shown dining on the stele was being served real food as well. Nor would we be able to tell how or why religious ideas about the afterlife emerged when and where they did. This is why looting must be prevented -- to preserve the very possibility of gaining these sorts of insights. The larger problem is Waxman's portrayal of the antiquities crisis as mainly a "tug of war" over coveted museum pieces. In fact, the more important battle concerns unprotected archaeological sites, and it is far less a matter of repatriating objects than of figuring out how to stop latter-day looters from destroying our collective past. That vital challenge remains unsolved. All of us who care about our collective past ought to be focusing now on generating and promoting realistic policy and legal measures that will reduce looting of sites in the most cost-effective way. I have suggested a few such solutions (impose a modest tax on antiquities sales with revenues dedicated to funding site protection in the countries or regions of origin; jawbone wealthy collectors to fund a non-profit foundation to develop low-cost anti-looting technologies and shunt assistance to those countries facing the most pressing difficulties; persuade countries, with the US leading the way, to contribute to the UNESCO fund dealing with the problem). 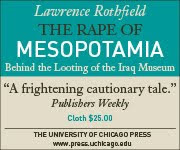 Others have suggested market-based mechanisms that would incentivize site protection; public-spirited initiatives to spur cities, universities, or even facebook members to adopt particular archaeological sites; and, of course, cultural-sensitivity campaigns designed to tamp down on the demand side of the antiquities market by demonizing collecting as akin to buying baby seal fur. With a new president -- from the University of Chicago, my home institution -- about to take office, there is a real opportunity to move forward. What we need now is a robust discussion where all these options and others are put on the table, critiqued, and refined.